The Monastery of St Paul de Mausole - Van Gogh's asylum, a photo by makingamark2 on Flickr. 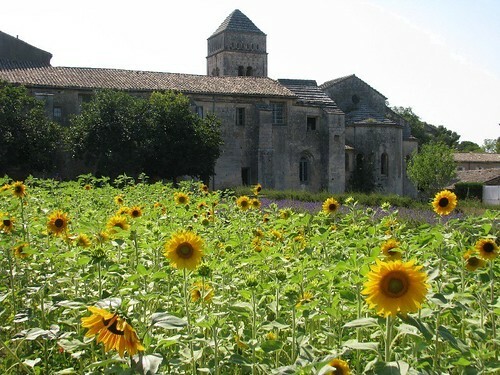 This is the monastery hospital where Vincent Van Gogh sought asylum after he became ill in Arles after he spent six weeks with Gauguin in the Yellow House. At the rear is a garden where sunflowers and lavender are grown. I only went to St Remy de Provence in the end. Last time I went to Arles and did not have enough time for St Remy. This time I drove across the Crau Plain and across the Alpilles - which made a lot more sense to me of the paintings he painted while in Provence. Posted by Making A Mark on Thursday, June 30, 2011 3 comments Who's linking to this post? Bedoin Market 27 June 2011, a photo by makingamark2 on Flickr. Yesterday was my third Monday of visiting the weekly Market in Bedoin. Actually managed to find out what was at the other end of the street this week as the Market is huge and absolutely fantastic. I wish that markets in the UK were more like this. I'll be uploading a lot of photos of what it sells when I get. Home next week. 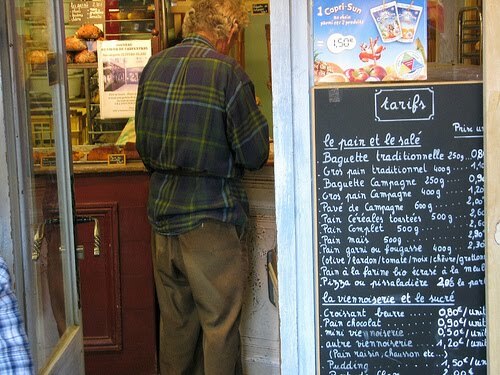 Tomorrow I'm taking Sarah Wimperis to Marseilles airport for her return flight and we're up early - hence no photo. 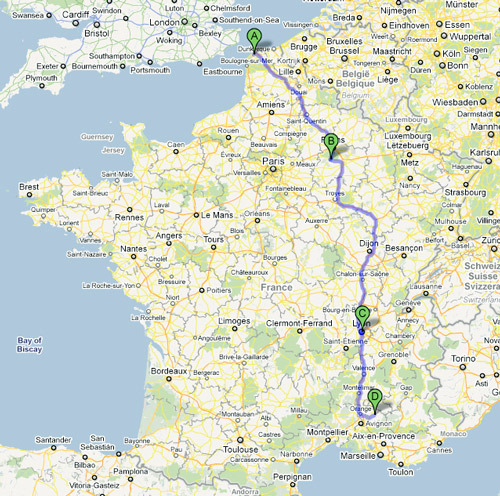 However I'm planning a return route which does a Van Gogh detour via Arles and St Remy de Provence. 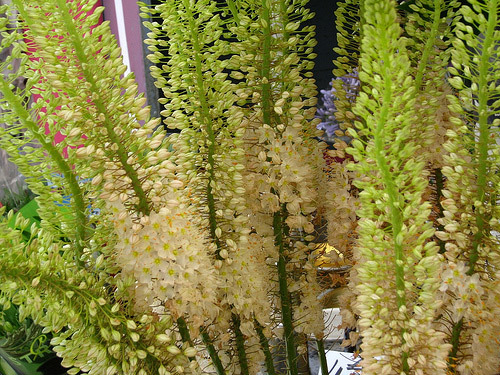 Posted by Making A Mark on Tuesday, June 28, 2011 0 comments Who's linking to this post? Lunch at Bedoin Market, a photo by makingamark2 on Flickr. I'm sat in Bedoin Market outside the hotel where we're getting our Internet access. the photo is of the paella which we bought for lunch last Monday from the man with the two huge paella pans about fifty feet from where I'm sitting. Very satisfying. Today we're off to Gordes (previously featured as a photo) to try our hand at capturing a large hill top village. Posted by Making A Mark on Monday, June 27, 2011 2 comments Who's linking to this post? Olives of Provence, a photo by makingamark2 on Flickr. 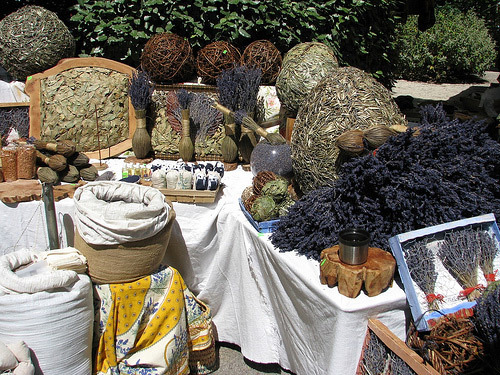 When I first visited Provence, one of ly lasting memories was of the stunning olive stalls seen in the various markets. Having returned to Provence I continue to be amazed by the sheer variety of the olives in any number of different marinades. These olives were photographed in the Market in Bedoin last Monday morning. Posted by Making A Mark on Saturday, June 25, 2011 0 comments Who's linking to this post? A stairway in Crillon Le Brave, a photo by makingamark2 on Flickr. Walking off lunch in the hill top village of Crillon Le Brave. We sketched the view and visited a painting exhibition in the tiny town hall. Posted by Making A Mark on Friday, June 24, 2011 1 comments Who's linking to this post? demoiselles des coiffees, a photo by makingamark2 on Flickr. I started a pastel of these very odd but interesting formations in the local ochre yesterday evening. This was after a day of trying to communicate with Ruth and Julian in England about the impact of a massive thunderstorm in the middle of the night which has left us without internet access or house phone. Progress is being made and hopefully I won't be posting from the hotel in town for the rest of our stay. All I can say is thanks goodness for iPads and the kind services of the Relais hotel in Bedoin. Posted by Making A Mark on Thursday, June 23, 2011 3 comments Who's linking to this post? We scored two and a near miss. Sault offers lots of painting possibilities and looks just the same as when I first visited some 20 years ago with a BBC film crew in tow (see The first time I went painting in Provence). I christened my new A3 size Moleskine with a marge sketch. From there we took the road up Mont Ventoux (height 1912 metres) safe in the knowledge that most sensible French people would be starting their evening meals and not driving on the mountain. We got most of the way to the top seeing only a couple of cars but the drive was very demanding and I was very glad I was on the mountain side of the road every time I saw the view as we got nearer and nearer to the top. Posted by Making A Mark on Wednesday, June 22, 2011 4 comments Who's linking to this post? 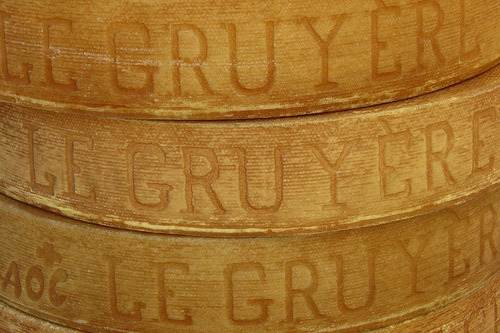 I havn`t been to Gordes in nearly 20 years - but have a number of very clear memories of it. It's a pretty special place even though it gets lots of visitors at times. 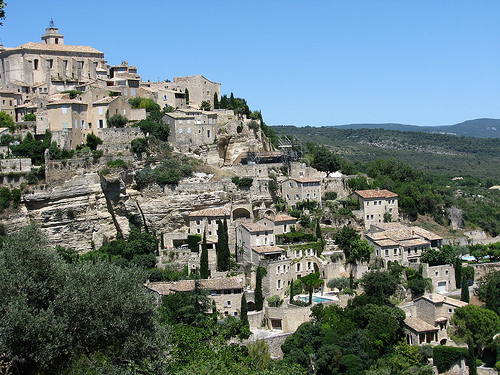 It`s also a village associated with artists and it rates as one of "Les Plus Beaux Villages de France"
The houses of Gordes cling to the side of the Vaucluse plateau, overlooking Cavaillon plain. They are arranged in tiers around the imposing Renaissance castle and church and narrow cobbled streets wind their way through them. Gordes is a village of artists and has been extolled by Marc Chagall, Victor Vasarely and Pol Mara ; it is a must on Provence’s cultural trail. This photo was taken from the viewing point off the D15 (route to cavaillon) on the west of the village - marked on the linked map on Flickr where we stopped so that Robyn and Sarah could take a look at what it's like. We're hoping to go back there later this week. Posted by Making A Mark on Tuesday, June 21, 2011 0 comments Who's linking to this post? 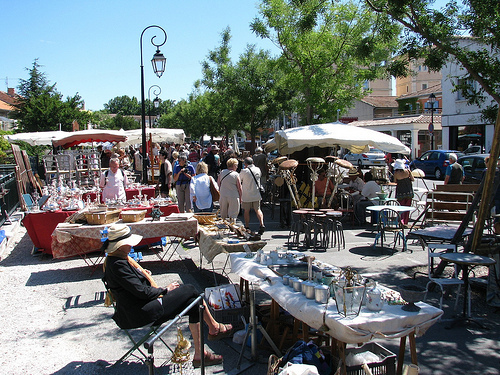 Every Sunday L'Isle sur la Sorgue is host to a market and a brocante market - an antiques market. 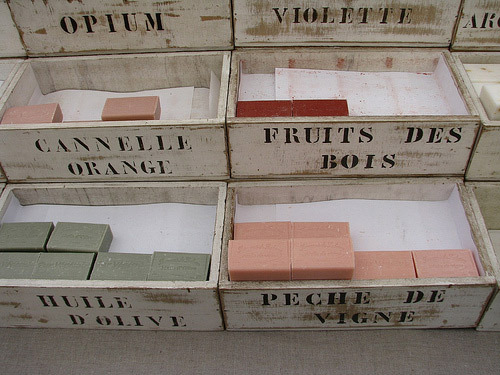 It's not cheap but I learned from Ruth Phillip's new book Cherries from Chauvet's Orchard, that it is the source of some of the still life objects seen in Julian Merrow Smith's Postcards from Provence. I'll be posting some more photos of the rest of the market at L'Isle sur la Sorgue later today (see below) - so come back later to see more. Now I'm off to the Monday market in Bedoin to get my fish for tonight's supper! I first visited these markets some 20 years ago - and they seemed to me to be exactly the same as the last time - right down to the stalls in the same places as I remembered them. Posted by Making A Mark on Monday, June 20, 2011 2 comments Who's linking to this post? 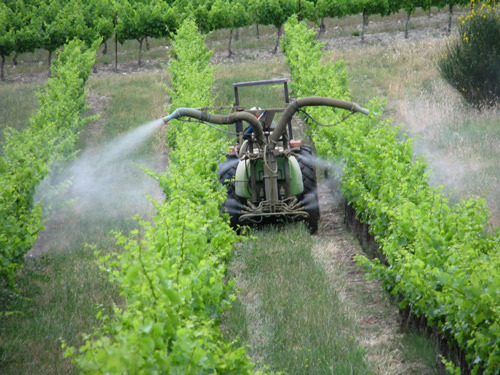 Spraying the vines - count the sprays! We had to move very fast yesterday to move the cars so as to avoid them getting a good dose of whatever it is that the farmer sprays on his vines. Posted by Making A Mark on Sunday, June 19, 2011 2 comments Who's linking to this post? a photo by makingamark2 on Flickr. We've been out for dinner once - on Ronelle's last night. However the night before we enjoyed fine dining in the house we're renting - courtesy of Ronelle van Wyk and Robyn Sinclair who made dinner. For our main course we had pan fried duck breasts, served with a strawberry and raspberry coulis, plus asparagus with Parmesan and a salad of baby spinach leaves, endive, celery and baby tomatoes. I couldn't resist a photograph. Posted by Making A Mark on Saturday, June 18, 2011 7 comments Who's linking to this post? Posted by Making A Mark on Friday, June 17, 2011 2 comments Who's linking to this post? Oil painting of Monet Ventoux by Sarah Wimperis, a photo by makingamark2 on Flickr. I woke this morning to find that Sarah Wimperis, who joined our painting house party yesterday, started painting out in the fields at 7am this morning. Posted by Making A Mark on Thursday, June 16, 2011 4 comments Who's linking to this post? After the bread and the wine come the cherries. 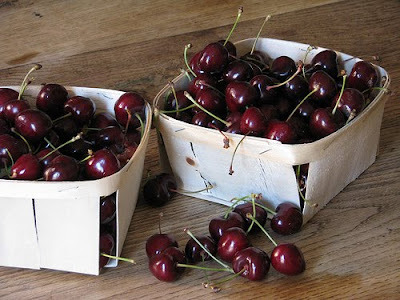 This part of Provence - the Vaucluse - has a lot of cherry orchards - and, right now, an awful lot of cherries for sale. These are some that Ronelle bought yesterday. Posted by Katherine Tyrrell (ipad) on Wednesday, June 15, 2011 3 comments Who's linking to this post? 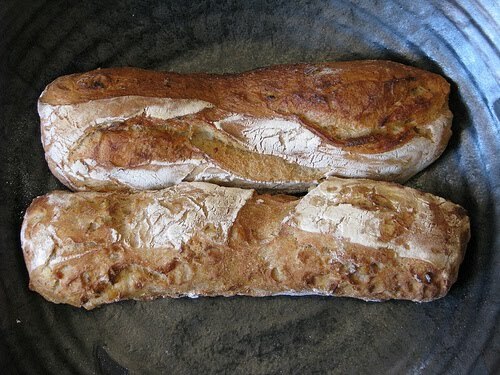 Which is how I came to buy and eat this bread. Trying new things brings it's own delight. Posted by Katherine Tyrrell (ipad) on Tuesday, June 14, 2011 2 comments Who's linking to this post? There's an awful lot of very famous wine areas in the Cote du Rhone wine region near where I'm staying - from Chateauneuf du Papes to Beaumes de Venise. Vineyards are great subjects for paintings - I wonder how many paintings I'm going to see of this one? Posted by Katherine Tyrrell (ipad) on Monday, June 13, 2011 2 comments Who's linking to this post? Sunrise over Mont Ventoux, a photo by makingamark2 on Flickr. I didn't have to go far this morning. I stuck my head out the door to look at the day and rushed back inside for my camera. This photograph was taken of the early morning sky above Mont Ventoux while I was stood in the road just outside the house in my PJs! Posted by Making A Mark on Sunday, June 12, 2011 7 comments Who's linking to this post? ...starting tomorrow morning at 7am when the car is finally packed to the gunnels and I set off for Folkstone and my first trip with a car through the Channel Tunnel. 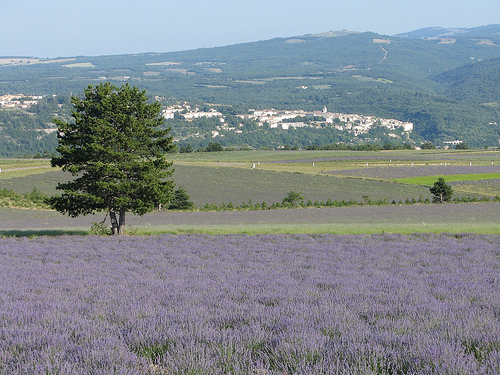 Then after surfacing in Calais, I drive all the way across France to Provence! It's actually over 1,000 kilometres (626 miles) which is nearly 12 hours of non-stop driving. Personally speaking I stopped doing non-stop driving on my own after a consultancy assignment lasting several months which involved me driving for five hours from London to Penzance in Cornwall every Monday morning - and then put in a full day's work. These days I like to make steady progress but break it up. I've actually driven across France before - but never done it both ways having previously let the motorail take some of the strain, mainly to save time. All navigation came courtesy of the big yellow book otherwise known as the Michelin atlas of France. This time my new satnav comes too. Current plans are to stop in Epernay, the capital of the Champagne world, on Thursday night, somewhere on the south side of Lyon, the the capital of gastronomy in France, on Friday night before getting to my destination on Saturday. 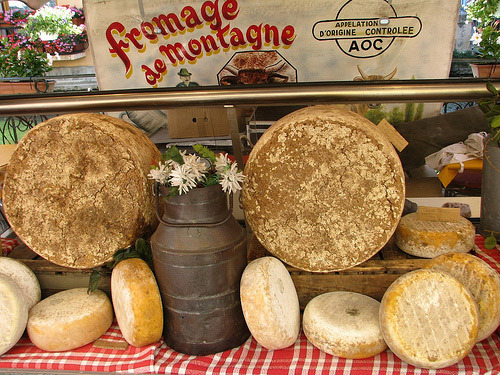 You may have guessed by now that I like the way the French value fine food and wines! 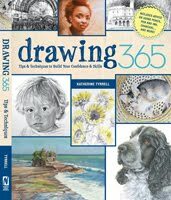 After that I'll be getting down to some serious drawing, sketching and painting. The alkyds and new brushes have been bought and packed along with the amazing amount of other stuff I seem to have decided it's essential to take. You can follow what we all get up to on Four Go Painting in Provence. You can follow all the places we paint in Places We Painted which also includes possible prospects for painting. 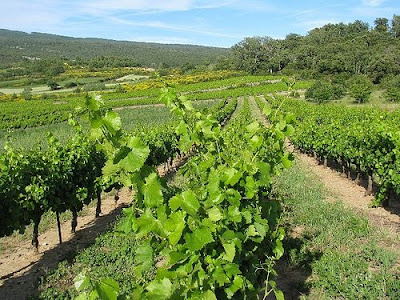 Today's post is about The first time I went painting in Provence - when the BBC came too! 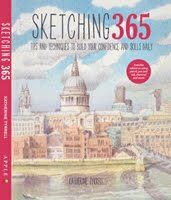 I'm also planning to post my sketches to Travels with a Sketchbook. Not sure if I've quite got a hang of mobile posting yet but I'm going to give it a go. I'll be back writing this blog normally again after 4th July - which is when I'm due back home after I've driven all the way back to London! Posted by Making A Mark on Wednesday, June 08, 2011 10 comments Who's linking to this post? 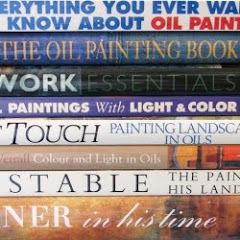 Who is your absolute favourite painter who uses watercolour paints (now or in the past) - and why? Many thanks to everybody who took the trouble to not only think of who their favourite artist might be but also highlighted why they liked his or her work. The out and out favourite is a bit of a surprise. Not because he's not very good but because he drew so much support from people in different parts of the world. Trevor Chamberlain ROI, RSMA was mentioned by four separate people who each singled out different aspects of his work to admire. Click this link if you'd like to see his work and the one in the table below if you'd like to read about him. Overall, you favoured contemporary artists more than artists from the past - however those you picked from the past are classics. Winslow Homer and John Singer Sargent are certainly two of my favourites - and I have my John Singer Sargent calendar on my wall in from of where I'm sitting! There can be only ONE: Botticelli! His purity, attention to detail, magnificent delicacy and extreme beauty simply cannot be compared. Tt's why, I'm sure, that the Vatican features so much of it! His work is inspired and incomparable! Emil Nolde is my favorite, his use of colour is juat wonderful. One of the first expressionists, member of Die Brücke. 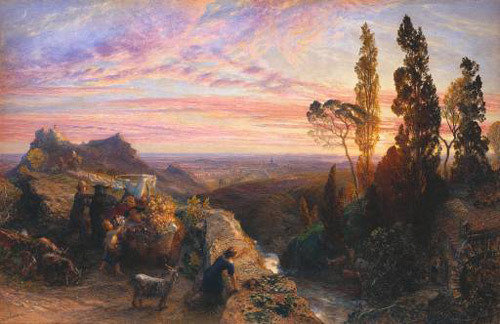 Samuel Palmer is my favourite. His use of watercolour was so different and personal and has a mystical quality so far removed from many of his contemporaries or indeed those who preceded or followed him. OK, I give up. I could go on all night. I should have stopped at Sargent. Unbeatable. I have always admired Mr. Milind Mulick's watercolours.He has so successfully adopted this traditionally western medium to suit Indian themes and subject matter. Joseph Zbukvic for his flair and joyful energy. Too bad he is so much copied now. Kiff Holland - seeing his watercolours in a show back in 1992 is what triggered my interest in giving painting a try. His work with glass is amazing. I have been fortunate to have taken workshops from him as well. Keiko Tanabe - I have seen her works in magazines and on line and love her approach, colour and atmosphere. For current painters, I have recently discovered Alvaro Castagnet and have been attracted to the vivid colours and energy in his paintings. They are so immediate and engaging. As luck would have it, I am going to be able to take a workshop with him this fall - really looking forward to that. It would have to be Trevor Chamberlain. He says so much with the apparent minimum of effort. Truly amazing. I believe Mr Trevor Chamberlain is perhaps my favourite watercolourist. Especially so because he painted exclusively in oils till the age of 40 and then out of pure inspiration taught himself to paint in watercolours and mastered the medium in a span of one year and surpassed most of his contemporaries. His use of colour and washes is most awesome. Trevor Chamberlain, no question. I could watch him paint all day, but sadly I have moved away from Hertford and no longer have the opportunity. He paints en plein air, all weathers, which is impressive enough, but his paintings always capture the essence of the moment, the scane, the light and with the minimum of fuss. Pure magic and definitely a master. Trevor Chamberlain for the careful observance of warm/cool in his subjects and the pitch perfect atmosphere. I love the dialectics of precise drawing and free flowing semi-abstract washes in James Hart Dyke's watercolors. I'm going to highlight more watercolour artists tomorrow which "got a mention"
The winner of the Tate Britain 2012 Watercolour Calendar is Vinayak B. Deshmuk (Vinayak Deshmukh Art) who lives in central India. I awarded it to Vinayak because his comment reminded me that not all art is western art and that there are a lot of very fine artists in Asia. It occurred to me that maybe I should try exploring Indian art a bit more! A calendar should now be in the post to Vinayak. 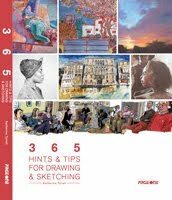 The 2012 calendar features beautiful large images from the exhibition and is produced exclusively for the Tate by www.FlameTreePublishing.com. Many thanks again toall those who participated in the exercise. I've certainly learned from it! Posted by Making A Mark on Thursday, June 02, 2011 7 comments Who's linking to this post? 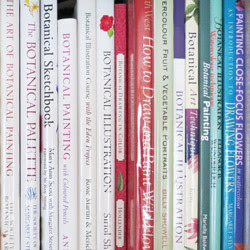 POLL: How many Art Societies are you a member of? One of my readers suggested that one of my monthly Making A Mark Polls should be about how many art organisations people belong to - and how much money they spend on subscriptions. 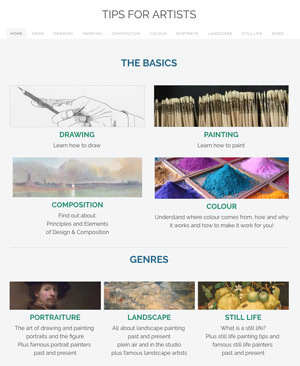 How many Art Societies are you a member of? 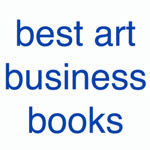 First we're going to look at how many art societies / art institutes / art organisations people belong to. Next month we'll look at how much it all costs. An "art society" is a group of artists who belong to one organisation in order to promote their art and/or the type of art they all do. Such organisations can be called different things but if it could be called an art society instead then it probably is! 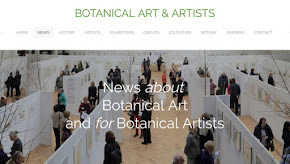 The Poll asks "How many Art Societies are you a member of?". It's open until 30th June and you can find it just below the list of recent top posts and just above the grid of followers faces in the right hand column. Did you stop and reflect on your answers after you gave them. Do they all mean the same to you? Which is your favourite art society - and why? 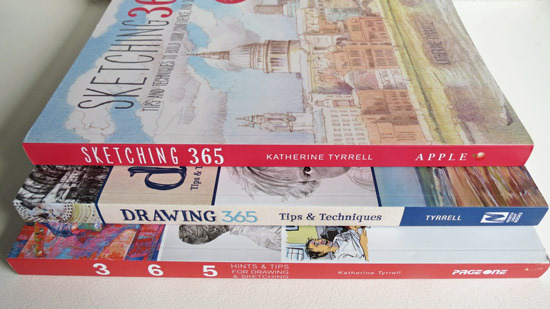 Is your membership of art societies increasing or decreasing? Maybe we could tackle another aspect in a qualitative way. I'm also interested in whether membership of art societies is increasing or decreasing - and why. You can comment below and the comments included will in the analysis of the poll results. Note: I'm not back from France until 4th July so the results of this poll and the next poll might not get done at the normal time. Posted by Making A Mark on Wednesday, June 01, 2011 6 comments Who's linking to this post?